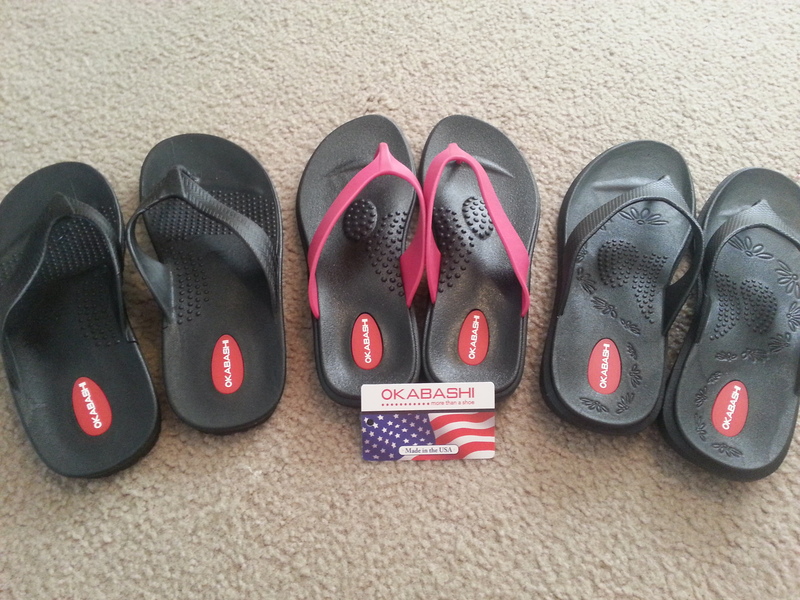 If you haven’t discovered Okabashi shoes yet, you NEED to. Go HERE now. They are made in the USA, anti-microbial, recyclable, and crazy durable. 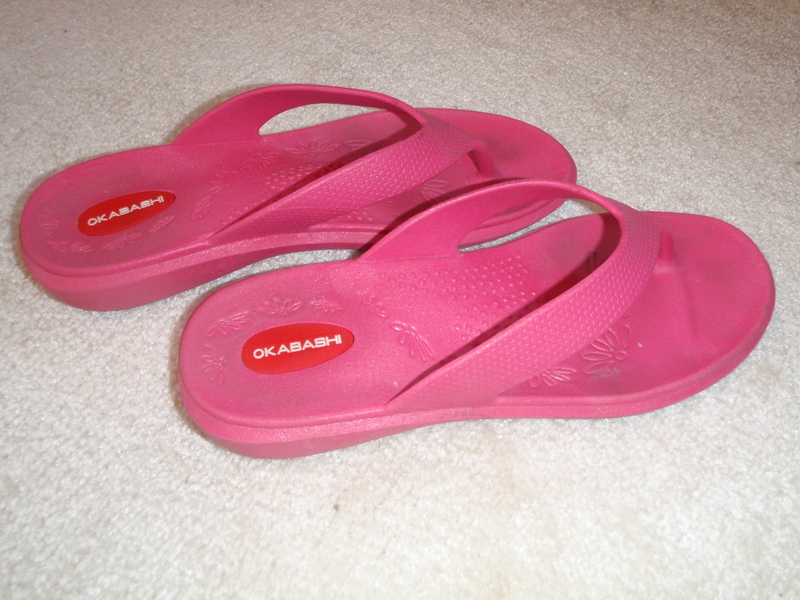 They make lots of styles but we are particularly in love with the flip-flops. Best. EVER. This last weekend we went in search for a replacement pair for Don because he LOST his extra pair. (*GASP* They were completely new too! We kept hoping they would turn up but no such luck. 😦 ) His first pair below was bought in June 2011. 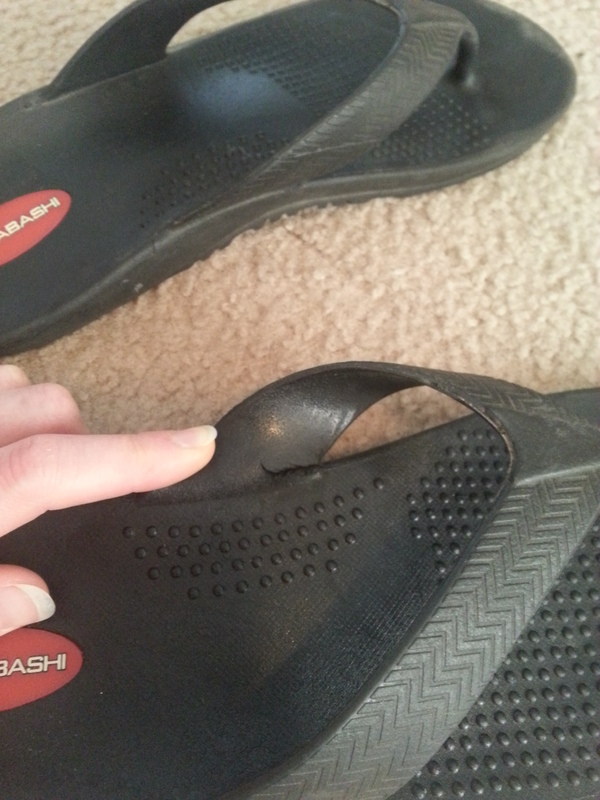 They are in relatively good shape still but he did manage to rip one, just a little bit. We scored a replacement pair for Don (Surf style) and he talked me into buying two new pair for me – a black in my usual style (Maui) and a black with pink straps in a new style (Ocean). Yay! 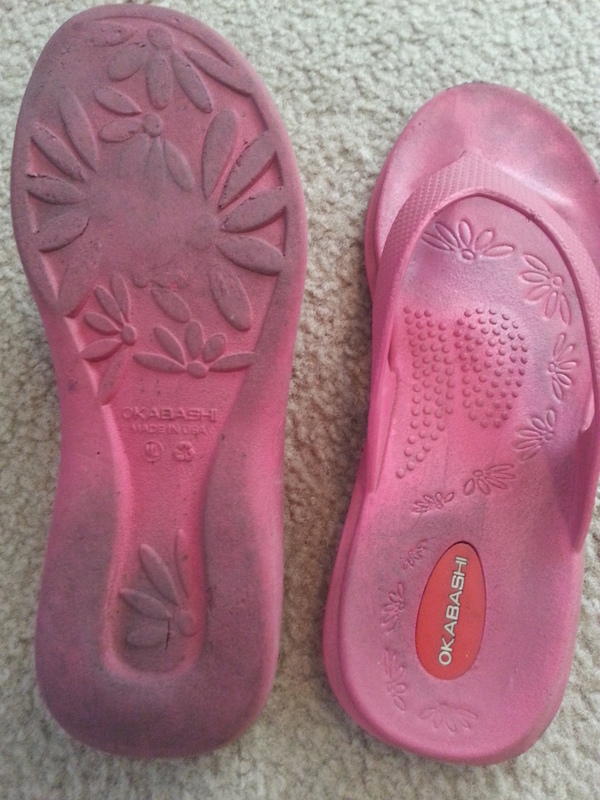 Apparently it is past time to retire my original pink pair from 2010. 😉 In my defense, I thought they were only 3 years old, not 4 and I didn’t realize how faded and dirty they are until I held them next to a new pink pair in the store. There is no such thing as “away”. When we throw anything away, it must go somewhere. **Please note, I have not been compensated in any way for this post; I simply like to share my product experiences with others in the hopes of exposing people to new ideas and products. 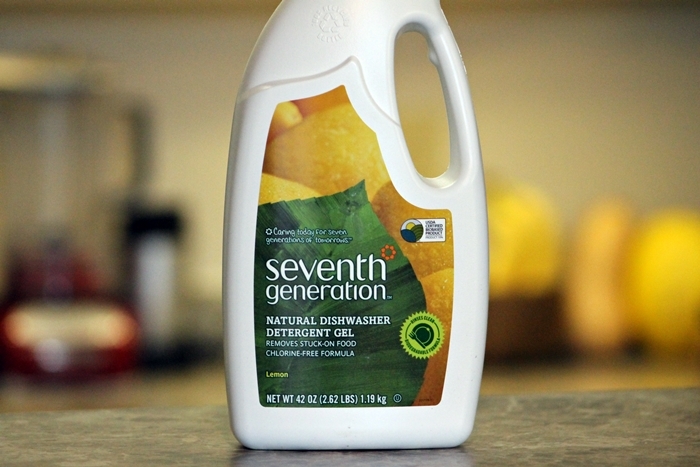 As a follow-up to my last post about chemical free hand soap and dish soap, here’s what I like best for dishwasher gel. It is a biodegradable formula that is chlorine-free and phosphate-free. Also, not tested on animals and made in the USA. Boom! Hits all my high points. Need a little more? The bottle is ALSO made from recycled plastic and is recyclable. The price is reasonable and you can find it online, on the Seventh Generation website, Amazon, in many local stores. There’s not a lot else to say. It gets the job done, smells good, and has all the qualities I look for in an eco-friendly product. If you’re looking for an alternative to the phosphate-laden chemical product you’ve been using for years and you didn’t realize was harming the environment as well as possibly harming you, then here’s a great option to try for your dishwasher. **Please note, I have not been compensated in any way for my opinion on this product; I simply like to share my product experiences with others in the hopes of exposing people to new ideas and products. The supreme reality of our time is …the vulnerability of our planet. 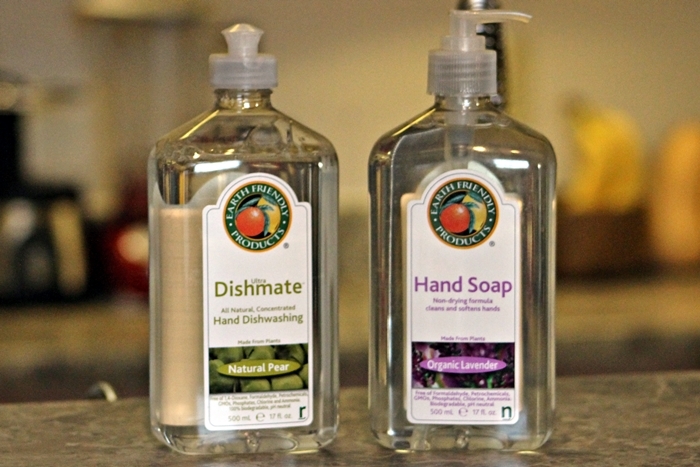 It took me a long time to find product replacements for our hand soap and dish soap. (Dishwasher soap coming in a future post.) It is easy to find natural bars of soap but I tried buying a soap dish and replacing the liquid hand soap with a bar soap. It’s still sitting there, barely used, staring me in the face. Every. Day. (Maybe I should just take it off the sink already. LOL) I don’t know about you, but there’s just something about liquid soap for washing your hands quickly at the sink. After much looking at brands and prices online, this is what I thought I’d try, and I LOVE them! If you’re looking for chemical-free options for your home, I highly recommend these and the Earth Friendly Products brand. Read more about the company here. You can find their products on Amazon and in a number of local stores. Just use their retail locator on their website to find something in your area. **I have not been compensated in any way for my opinions on these products; I simply like to share my product experiences with the intent of introducing others to new or different ideas and products. Approximately 72 percent of the waste currently being landfilled or incinerated consists of materials that could be put to higher and better use through recycling or composting. Most of this material is office paper, cardboard, non-recyclable paper, and food waste. 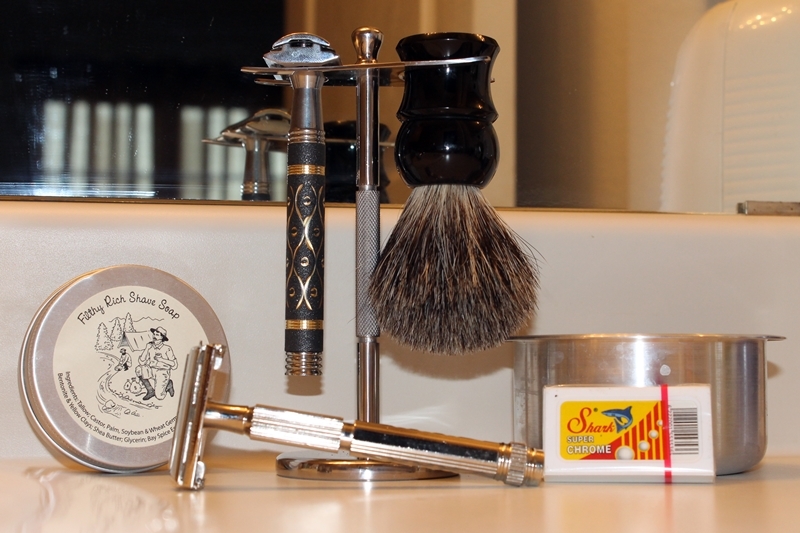 It’s been almost a year since we switched from conventional, disposable razors to the old school shaving method with safety razors. It was one of the best decisions we’ve ever made. We’ve saved a ton of waste in the form of disposable blades and shavers over the past year and I’m certain we’ve saved money through the entire venture too. Our stainless steel safety razors are longer lasting and the blades are recyclable (check your local rules). 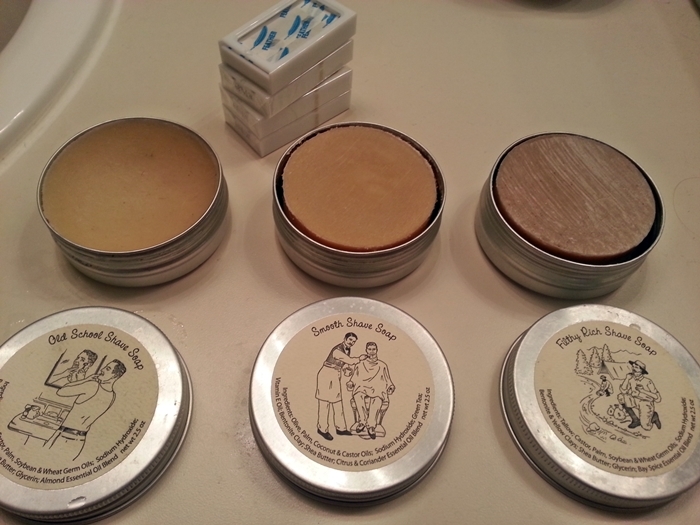 The soaps from Seattle Sundries are all natural and Don highly recommends them for shaving for men. I use natural-made soaps as well: Grandma’s Lye Soap, all natural soaps by Kreationzbyme on Etsy, and Dr. Bronner’s Magic Pure Castille Liquid Soaps, to name a few that have worked for me. Yes, it took us both a little bit of time to adjust to the new razors. We both had to re-learn how to shave, just a little bit. But now that it’s commonplace for us both, we whip through our shaving routine just as quickly as we did before and our safety razors give us a much closer shave than any other. As a women, I’m able to shave all the necessary areas without any problems. I’ve had a couple of nicks but that’s no different from when I used disposables. Truly, I recommend it to everyone out there. People underestimate their capacity for change. There is never a right time to do a difficult thing. Someone asked me once in the recent past if I was a hippy and I jokingly replied, “In what way, specifically?” I was giving the poor guy a hard time because, yes, in many ways I suppose you could call me a hippy. Or crunchy. Or granola. Although none of these terms accurately defines all my values and beliefs. An adjective used to describe persons who have adjusted or altered their lifestyle for environmental reasons. Crunchy persons tend to be politically strongly left-leaning and may be additionally but not exclusively categorized as vegetarians, vegans, eco-tarians, conservationists, environmentalists, neo-hippies, tree huggers, nature enthusiasts, etc. That sounds more like me. But, I find that this term is generally used in reference to parenting style and encompasses choices that, due to their relation to parenting, don’t fall into the scope of my world, such as cloth diapers, baby-led weaning, home births, etc. Which, for new readers, is not part of The Journey of Two…we’ve made the choice not to have kids. An adjective used to describe people who are environmentally aware (flower child, tree-hugger), open-minded, left-winged, socially aware and active, queer or queer-positive, anti-oppressive/discriminatory (racial, sexual, gender, class, age, etc.) with an organic and natural emphasis on living, who will usually refrain from consuming or using anything containing animals and animal by-products (for health and/or environmental reasons), as well as limit consumption of what he or she does consume, as granola people are usually concerned about wasting resources. Usually buy only fair-trade goods and refrain from buying from large corporations, as most exploit the environment as well as their workers, which goes against granola core values.